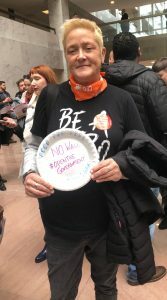 After going through a security checkpoint, protestors walked into the Hart Senate Building at noon today and were immediately greeted with invitations to write their sentiments in Sharpie on Styrofoam plates. 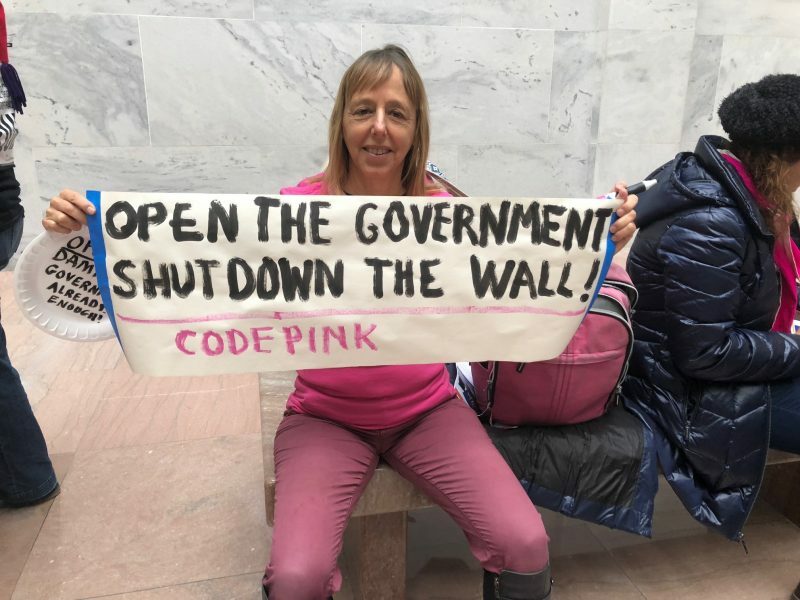 Some came with nothing more than compassion for federal employees, others brought along signs and agency affiliations. Jeni Sands, a local caterer who has lost business due to the shutdown. She came out to support federal workers. Messages on the plates read “no wall” and “stop the hostage taking.” The environment was hushed, perhaps due to the officers that surrounded the area — but charged. Spectators viewed the hundreds of protestors from the many floors overlooking the building lobby. Nearly a dozen organizations collaborated to put together the protest, including the National Federation of Federal Employees (NFFE) and the Machinists Union. Workers are suffering the most because of this shutdown, Benjamin said, noting that she has heard “a lot of sad stories about people who are potentially losing their homes, who can’t get the medical care they need, who have to make choices between food and mortgage payments.” She herself has many friends who are federal employees who face financial uncertainty because they don’t know when they’re going to get paid again. 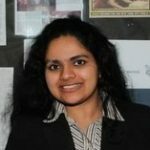 “I don’t think that should be the case in this country,” she said. 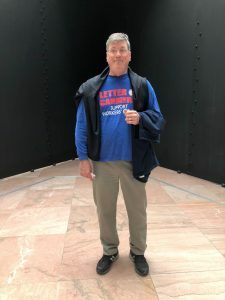 Jim Sauber, Chief of Staff of the National Association of Letter Carriers, told GovLoop that he and other members of his union came to the protest in solidarity with their brothers and sisters in all the federal unions. After 33 minutes of silence to mark the 33 days of a partial government shutdown, protestors took up the chant “no more food banks, they need paychecks!” The rhythmic refrain grew in volume before it was hushed, and the crowd finally instructed to disperse.